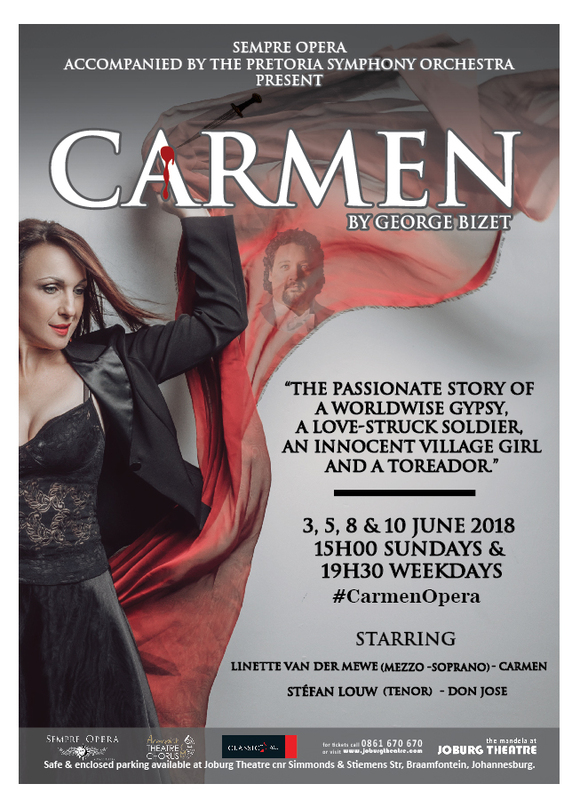 Founded in 2011, Sempre Opera, in collaboration with Joburg Theatre, is proud to announce its upcoming production of Carmen by George Bizet on The Mandela Stage for four performances only on Sunday 3rd, Tuesday 5th, Friday 8th and Sunday 10th June. Free she was born, and free she will die! Seville, Spain. A gypsy is determined to live life on her own terms – whatever her fate may be. The passionate triangle of the world-wise gypsy woman, the jealous soldier willing to lose everything for her reciprocated love, and the toreador that will win her heart is one of the world’s most loved operas. This masterpiece blends passion, seduction, jealousy, betrayal and even a little law-breaking, all set to one of the most famous scores ever composed. The desperate young soldier Don José is led astray from his village life and love, the adoring village girl Micaëla, as he chases the irresistible and enchanting gypsy Carmen. Her seduction and charms lead Don José into obsession and ruin when she leaves him for the swaggering bullfighter, Escamillo. Directed by well-known baritone Danie Verster, Carmen will be fully staged and will feature the Pretoria Symphony Orchestra and the Armonia Theatre Chorus, under the baton of Schalk van der Merwe, one of South Africa’s ambitious, upcoming conductors. Carmen features a local and international cast with seasoned and young and upcoming opera singers. Mezzo-soprano Linette van der Merwe stars as the strong-willed and seductive gypsy who destroys the naïve, lovesick soldier Don José. José is played by Stéfan Louw, well-known tenor on opera stages in South Africa and abroad. In other leading roles, baritone Christian Bester, residing in the United States since 2006, will return to his home country for the role of the dashing bullfighter Escamillio, and sopranos Lauren Dasappa from Cape Town, and Marina Botha-Spies will share the role of Don José’s sweetheart Micaëla. In the roles of Carmen’s gypsy friends, soprano Ailyn Nienaber will star as Frasquita, and visiting American soprano Loralee Songer as Mercédez. Chris Mostert (tenor), Walter Fourie (tenor) and Lourens de Jager will be seen in the roles of Remendado, Dancairo and Morales. The opera will be sung in French with English supertitles. Come experience this most vivid of operas, performed by a dynamic local and international cast. Sunday, June 10th at 15:00. Ticket prices are from R200 – R475. Bookings are through www.joburgtheatre.com or by callling 0861 670 670 / 011 877 6855 or through Webtickets.